Kerseys Sponsors Balloon Art exhibition Inflated Inspirations, which is balloon art based on the work of Pop My Mind (PMM). 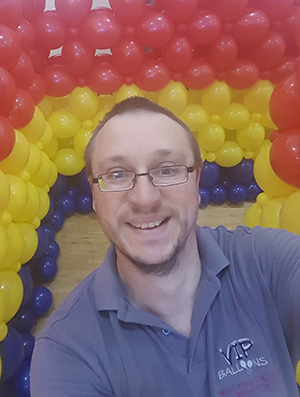 Award-winning balloon artist Samuel Stamp-Dod of VIP Balloons came up with the idea to make the online work physical – albeit just for a couple of weeks. The former Suffolk College performing arts student said: “I loved the PMM idea, whereby one artist inspires another’s work and so on. I wanted to create a balloon sculpture which also had an artistic message. “I would like people to see the art first and then notice the balloons. The exhibition would only last a couple of weeks at most because the balloons will deflate. Samuel will team up with a dozen other balloon artists and guide them in building the exhibition. The work will take a week to prepare – and the exhibition will run for 11 days. The work will see a full-size tree grow from the centre of the gallery – with its branches leading out to new works inspired by pieces in the PMM collection. The exhibition will be immersive and interactive – encouraging visitors to walk through, touch and explore the art. Oliver Squirrell, a musician and photographer, set up PMM for painters, film-makers, musicians, poets and creative artists. The exhibition is free to all members of the public. A range of activities will be hosted during the day which will be suitable for children and families, followed by entertainment in the evening geared towards adults. The exhibition will be held at the Waterfront Gallery, part of the University of Suffolk, this summer, from Friday, July 28, to Monday, August 7.